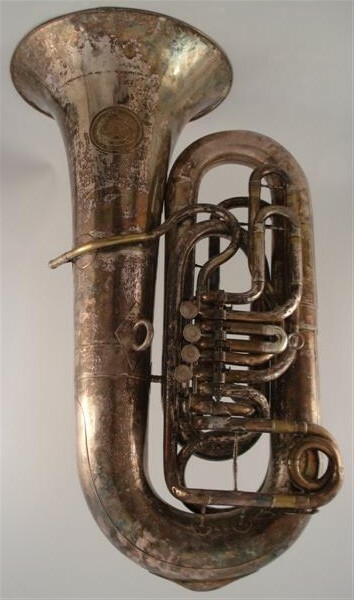 This tuba features an 1873 patented feature of Cerveny instruments, their Walzenventile, or “roller valves”. This roller valve mechanism is basically rotary valves that have been rotated 90 degrees from their typical position. This was done to simplify the mechanism, by increasing the mechanical advantage of the lever system. The 1873 patent also covered the spring tension adjusting screws, seen in this example as well. This mechanism was an extra cost option on their higher grades of instruments. 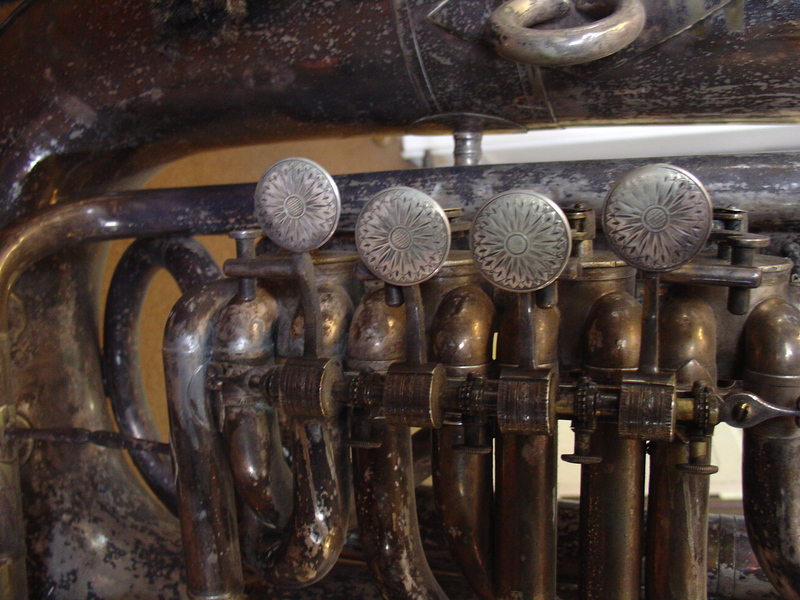 This tuba is probably an example of Cerveny’s primer quality concert tuba, owing to all the beautiful touches, from the engraved valve mechanism, to the incredible dealers label. Many people don’t know that the striking Louis Vitak seal was a tag put on by the north american dealer, located in Chicago. 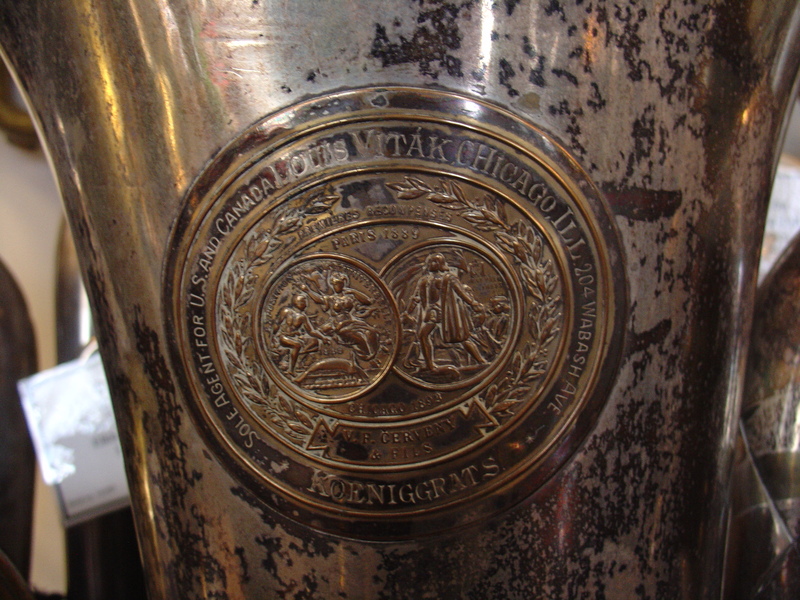 The seal used in the home market was much less detailed, as shown on the roller-valve euphonium #200701 in the feature collection. There is a large brass seal on the bell with two engraved pictures on it. “SOLE AGENT FOR US AND CANADA LOUIS VITAK, CHICAGO, Ill. 204 WABASH AVE. KOENIGGRATS” on outer part of seal. “PREMIERES RECOMPENSES, V.F. CERVENY & FILS PARIS 1889- CHICAGO 1893” on inner part of seal. “EXPOSITION UNIVERSELLE 1889 / HRISTOPHER COLVMBVS OCTXII [illegible]” on center of seal.